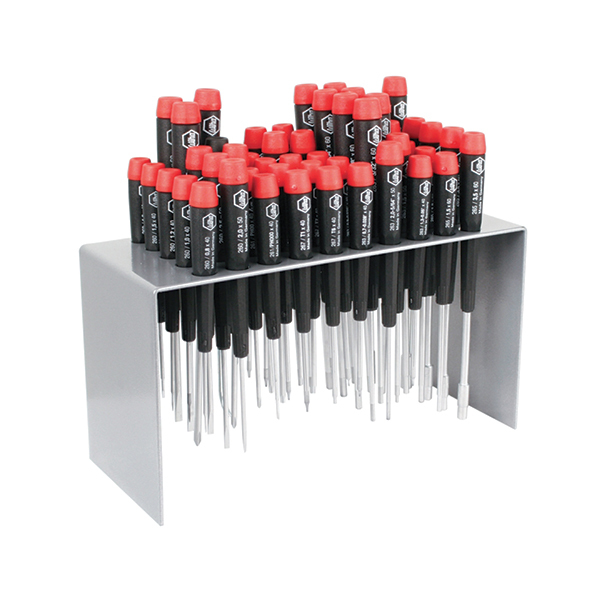 This 51-piece set from Wiha offers incredible utility, versatility and quality. These tools have large, sturdy handles constructed of cadmium-free plastic with a rotating cap for precise turning and control. Hard-chromed non-slip CVM steel tips are precision-ground for a perfect fit every time. Set includes: Slotted: 1.5, 2.0, 2.5, 3.0, 3.5, 4.0 mm; Phillips: #000, #00, #0, #1; Hex metric: 1.3, 1.5, 2.0, 2.5, 3.0, 4.0 mm; Hex inch: 0.028 inch (0.71 mm), 0.035 inch (0.89 mm), 0.050 inch (1.27 mm), 1/16, 5/64, 3/32, 7/64, 1/8, 9/64, 5/32; Torx: T1, T2, T3, T4, T5, T6, T7, T8, T9, T10; Pentalobe: PL1, PL2, PL3, PL4; Nut drivers: 1.5, 1.8, 2.0, 2.5, 3.0, 4.0, 4.5, 5.0, 5.5 mm; Chip lifter: 1.0 x 2.0 mm; plus a space-saving, custom-fitted steel bench stand/organizer.